The best way to find a reference files management system which works for you is trial and error. However, all this trying and erring might leave a messy trail of duplicate files. You end up with more duplicates after sharing your pdfs with colleagues while trying to maintain your own system. A brilliant little app called Gemini cleans up this mess with humor and cool design. I use Papers for managing pdfs of scientific literature and automatic filing by date for other reference files (I also use OpenMeta tags for quickly finding my files). 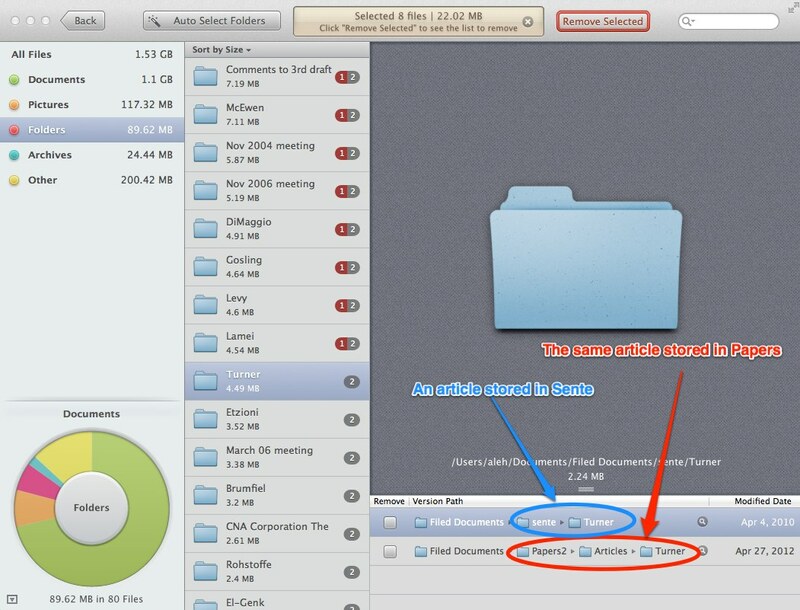 To share some of my files with students, co-authors or colleagues I usually copy them to a shared Dropbox folder. This works fine except after I often forget to remove the copies after the collaborative project has ended. This leaves me with a lot of duplicates. Another source of duplicates is switching from one file management system to another, an unavoidable side effect of technological progress. Prior to using Papers I used Sente for storing scientific articles, and before that I used automatic filing by date and tagging, and even prior to that (especially during the PC era) I sorted my reference files into hierarchical folders organized by topics. Moving documents from one system to the next is never seamless and as a result I ended up with a great deal of duplicate files stored in different folders. All these duplicates show in searches and take up disk space. Recently I have downloaded Gemini and conducted a major cleanup saving over 6 GB of disk space. I can also remove duplicates with DevonThink, but it is a much more expensive and slower program designed for a different purpose. Besides it’s not as smooth and fun. This entry was posted in Files and tagged DevonThink, OpenMeta. Bookmark the permalink. Nice post , Just wanna share I’m using an alternative tool called “Duplicate files Deleter” Its an easy fix for duplicates aswell.